Howdy gang – I’ve returned for my second and final issue of Pulp! Alastair will be back from his self-appointed hiatus as of the next issue. So what can I say? It has been a short and sweet experience on my behalf and hopefully not too disturbing for you guys. 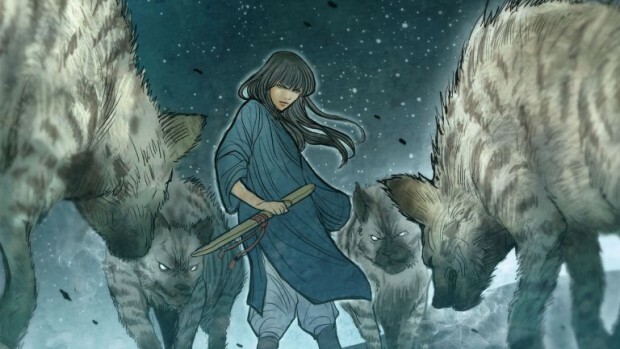 Monstress is set in an matriarchal society, in a realm reminiscent of a early 20th century Asia. The story follows Maika Halfwolf, a teenage girl and a Arcanic (a race of magical creatures who sometimes resemble humans), who is seeking revenge on the Cumaea – an order of sorceresses who consume Arcanics to fuel their power – that killed her mother. Within the first few pages, you are introduced to a crumbling and desperate world after a long war between the Arcanics and Cumaea. The story itself produces some seriously dark tones, and after awhile you find yourself wondering if Maika is really the hero of this story. This preconception comes further into question when you find out that she shares a mysterious psychic link with a powerful demon known as one of the Old Ones from lore. Throughout the story we are confronted with many horrid acts, done both by our protagonist and the ones who choose to stand in her way. In fact, the characters not only seem to step lightly over the grey line of a blurred morality, but dance all over it. One line within the first volume really paints a picture of the Monstress world: ‘There is more hunger in the world, than love’. This line gives you a uncensored and unadulterated look at the mentality of the characters within this world. In the end, I found Monstress to be a true piece of art. While I constantly found myself questioning the motives and morals of, well, everyone, the exceptional writing and beautifully depicted artwork connected me with the protagonist, and even the seemly unimportant characters – no matter how brief their lives may have been. If you haven’t already, I highly recommend you pick yourself up a copy of Monstress – you won’t regret it.